The brush head is angled and relatively small, with a very fine edge, making it easy to achieve a neat, tidy, defined brow. The brush offers easy application with both powder and gel products, as although fairly fine, the brush head is actually quite dense and firm. It also washes nicely and retains its shape once dry. I initially used this brush with a matte eyeshadow from my LORAC Pro Palette (great for beginners). But have since found it works pretty darn well when used with my Anastasia Dipbrow Pomade. The Dipbrow is smudge resistant and waterproof and with a little patience helps to create the perfect brows. 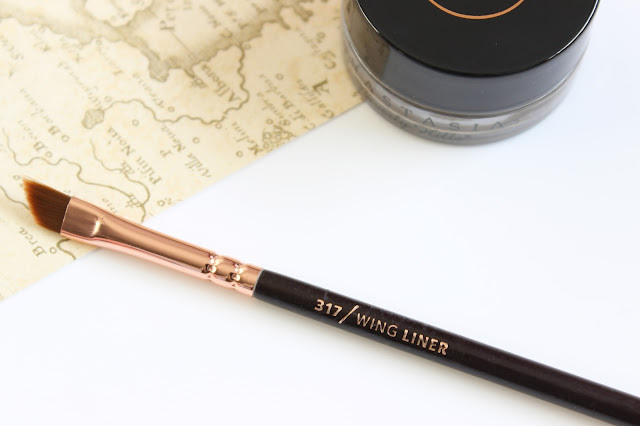 At first I was hesitant to use an angled brush to fill in my brows, as I presumed this would be far harder than using the likes of an eyebrow pencil, but I was so wrong. This brow brush is quite frankly a thing of perfection and by far the best brow brush I have ever used - my brows wouldn’t be the same without it! If you buy one thing this month and, treat yourself and your brows and buy a Zoeva 317 Wing Liner Brush for just £5.95.